I’ve been making some positive life changes lately. You know, the usual stuff: eliminating stress, exercising more, focusing on the things in life that are important to me, … and transforming into a mermaid!? But, the first stage is done: a new skin! My deepest gratitude to Eloh Eliot for her Starlight skin, which I used as a base. Without Eloh’s generosity, my skin would have taken weeks, instead of a few days. Actually, I probably wouldn’t have even attempted it, as it wouldn’t have been worth the time investment. Help Support Max the Virtual Guidedog! 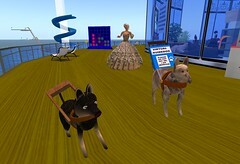 Virtual Helping Hands are having a fundraising benefit at Wheelies for continued development of Max the Virtual Guidedog. I first blogged about the scripted guide dog last August. Since that time, the VHH team has made amazing progress! They’re playing a video at Wheelies of their recent RL presentation about Max, and it’s great to see how many technical obstacles they’ve overcome. VHH are now trying to raise funds to purchase some needed development software so they can continue enhancing Max Voice, a cross-platform application providing text-to-speech for SL chat, as well as other assorted helpful functionality. The development software costs $550 — but the price is expected to go up drastically in mid-April, so they need to purchase it soon! When I visited them earlier today, VHH had raised $100 of the needed $550. The benefit runs until midnight PST tonight (March 29). 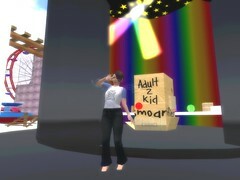 You can help by donating L$ in SL at Wheelies or via Paypal at VirtualHelpingHands.org. Any amount helps. An abstract sculpture I created on a whim. It’s 8 prims, created it in Blender in about 1 hour. 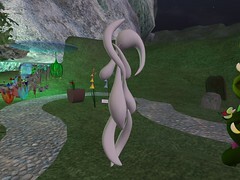 You can view it at my friend Skitty’s flower shop in Second Life. The sculpture is not for sale (but the pretty flowers are!). Some recent posts by Botgirl Questi inspired me to get out my Femme Noir outfit: all-black skin and eyes, fullbright white hair (with signature rainbow strands, naturally) and wings. Messing around with Windlight sky settings. You can download the preset if you want to try it. It reminds me of an October twilight I saw as a kid. A low mist / fog was rolling in over the park. I had never seen such a thing before. The sky looked faded and ill, and one could believe that the sun might not rise again. There are more pics, so check out the rest of the set. We had a ton of fun at the Squidogram Relaunch Party yesterday! Check out the full set on Flickr! 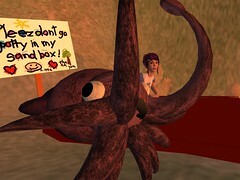 Want to get your hands/paws/hoofs/tentacles on your own Squidograms? 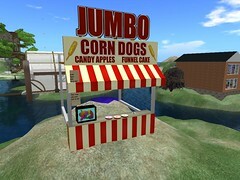 You can buy them inworld at Cuddlefish Junction, or on SLX! 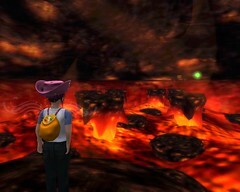 I’ve posted a photo journal of my sister-alt’s visit to Loco Poco’s Island. It was crazy fun! Check out the full set, and check out the Kids5B event! The themes this round were Snack Time , Sour , and Liquid ! Participants were Kath Catteneo, BritneyJ Crimson, Chrysocolla Rau, and Jacek Antonelli (that’s me). We got together on January 13 to show our stuff! Check out the rest of the set! 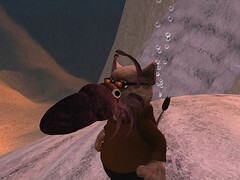 You can also see them for yourself in Second Life!